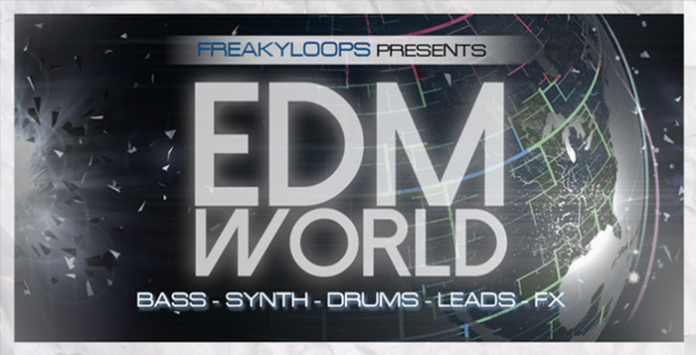 Freaky Loops is proud to present ‘EDM World’ sit back and prepare yourselves for a deep insight into the ‘EDM World‘! You can expect to find here with 1.13GB of material spread over 377 loops & samples and 40 Midi Files. Also there is a special Bonus folder with some tasty extras filled with 22 loops & samples – you are sure to find what you need to create your next EDM anthem! This huge pack will offer you everything you need to create your own productions. Full of meaty main-room hooks, pumping minimal beats, key labeled big drums, speaker shredding synths and brazen basslines, inspirational melodic synth leads, live percussion, late-night leads to smokey stabs, floating arpeggios to trippy chords, silky smooth FX to punchy plucks, huge gated pads and twisted vocal loops.. A powerful tool for your studio with more innovative sounds. ‘EDM World‘ includes, 305 loops locked at 128 BPM, 50 mind-blowing oneshots, 40 midi files and 1 inspiration kit. If that wasn’t enough there is bonus tools folder consist of 22 loops & samples. In details; Loops folder contains, 110 Drum Loops, 70 Bass Loops, 35 Synth & Chord Loops, 30 Combi Loops, 30 Drop Lead Loops, 15 EDM Fills and 15 Fx Loops. Oneshots folder consist of 50 killer FX Hits. Inspiration kit includes 6 stems and 1 full mix AND 40 Midi Files foldered as 12 Bass Midis, 17 Drop Lead Midis and 11 Synth & Chord Midis, that giving you the option the slightly change the notes, adjust melodies or completely change things up. Lastly some very useful loops & samples waiting for you in the Bonus Folder consist of 10 Drums, 8 Fx and 4 Vox. All loops & samples are key and tempo-labelled for flexibility. ‘EDM World‘ is here waiting to be discovered!